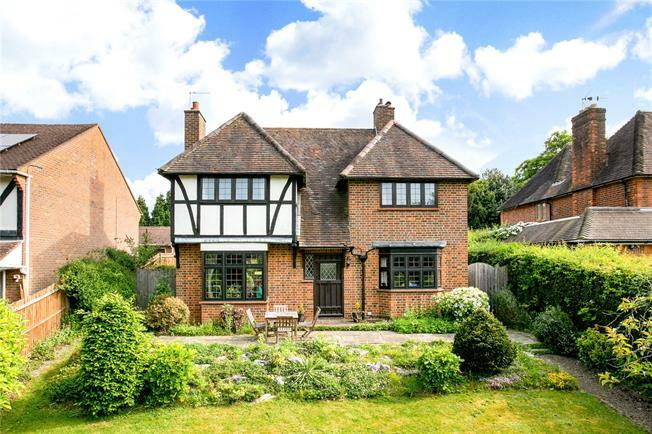 4 Bedroom Detached House For Sale in Beaconsfield for Guide Price £1,195,000. This attractive period house, built in the 1920s and rarely available to the market, offers detailing such as wooden latched doors, picture rails, open fireplaces and features such as two bay windows to the sitting room. The house presents an exciting opportunity as has opportunity for both renovation and extension subject to usual consents and is located in a highly sought after road close by to both Beaconsfield train station and the new town amenities. The sitting room is generous in length and enjoys a double aspect with two bay windows, oak floor and brick and tiled open fireplace. Double doors lead directly into the family room which has a glazed roof and French doors leading directly onto the dining terrace. The kitchen/breakfast room is situated to the rear of the house with views over the garden. The adjacent utility room has space for a washing machine and tumble drier. The dining room has lovely views of the front aspect from its bay window and the study offers a quiet area to work. To the first floor lies a generous landing with space for furniture. The master bedroom has a rear aspect and en suite shower room. Three further bedrooms have access to the family bathroom. The house is located in a highly popular road that lies immediately adjacent and within half a mile of the centre of Beaconsfield New Town and mainline railway station. The road offers a wide range of residential housing stock in private gardens and leads directly to woodland walks in Hogback Wood. Set within a private garden plot the house enjoys a high level of seclusion to both the front and the rear. The town garden is mainly laid to lawn with mature hedging boundaries and path to the front door. The rear garden has a full width dining terrace and attractive landscaped and stepped beds, set within sleepers. The upper level is laid to lawn with access to a single garage with tandem parking in front.